We inherited it from my husband’s old roommates when the house members disbanded to pursue their separate paths in 2009. I was there when they picked it out, at a Salvation Army thrift shop near 25th and Valencia. A purple sectional with a built-in acrylic coffee table and boombox had also been in the running. I’m glad they chose this one instead. It is comfortable and wide and I have fallen asleep on it more times than I’d like to admit. Recently, however, our sofa has been looking a bit tired. Or, to rephrase, we have started to get a bit tired of looking at our sofa. Same goes for the rest of our living room furniture. Finishing grad school was like waking from a dream; I looked up from my computer screen to find we were living amongst a bunch of ugly, broken furniture. But what is the optimum layout for the room? How to choose pieces that fit with our overall aesthetic as well as that of the house? These are all pressing questions (please feel free to weigh in). 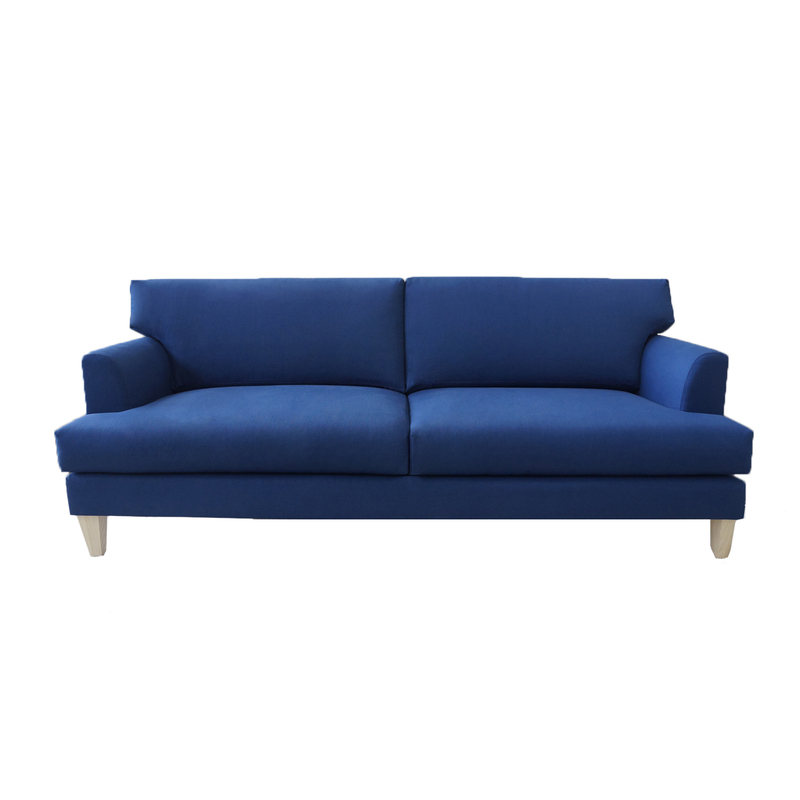 My first step, however, has been to explore: How to buy furniture without flame retardants? Increasingly, research has indicated that flame retardants (added to an alarming number of children’s products and furniture) are implicated in a host of adverse outcomes, including reduced fertility, birth defects, and cancer. How to tell if your furniture contains these harmful chemicals? Read the label. If it states that the item complies with California Technical Bulletin 117 (TB117) and / or contains polyurethane foam, it almost certainly does. Our sofa did. The good news, is that–largely due to the efforts of chemist Arlene Blum (who sounds like an amazing woman–more on her another time), California has changed its policy. As of January, 2014, furniture manufacturers are no longer required to use flame retardants. The chemicals are not banned; but, as of January, 2015, manufacturers are required to indicate the presence of flame retardants on their label. A few manufacturers have announced dedication to making flame retardant-free furniture. For example, EcoBalanza, Viesso, and Ekla Home. Their sofas, however, all seem wildly expensive. The cheapest I could find clocked in just under $2,000. 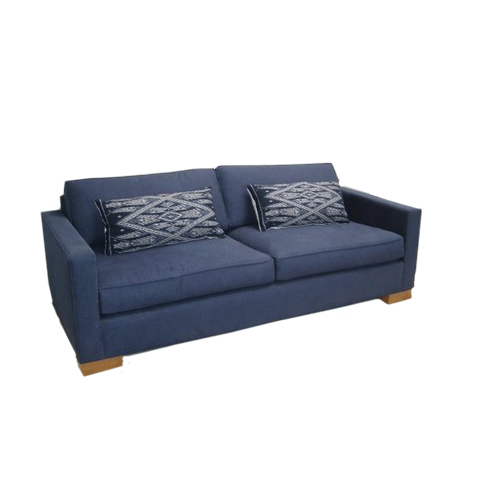 According to the Environmental Working Group, many mainstream manufacturers (such as Ikea, Crate and Barrel, and Room & Board) are making the switch; just be sure to check the label to ensure that your sofa isn’t a 2014 model and is flame retardant free. In the mean time, the Green Science Policy Institute recommends reducing the threat of harm from flame retardants by reducing dust (where the chemicals tend to congregate) by vacuuming with a HEPA filter, washing hands frequently, and using a wet mop. My husband, on the other hand, has decided he wants to make our own sofa (my mother-in-law made hers, in the ’70s). Are we crazy? How did you select your sofa? It’s interesting to learn about flame retardants: I haven’t heard this before. We chose two matching sofas so they/we could face one another. We wanted what is apparently called a “conversation set”: two couches facing one another with a rug and coffee table. I thought this would section our open plan kitchen, dining and living room. We wanted to watch less TV, so we put that in the bedroom and left the living room for chatting, cooking, eating, reading and cat-cuddling. This was the plan anyway. In reality, we never got around to finding a rug and coffee table we liked and now spend too much time in bed watching TV! 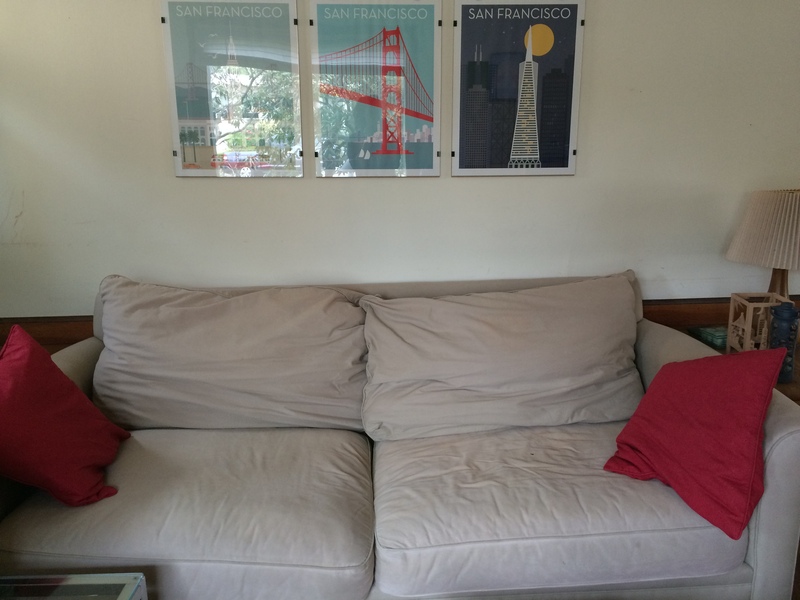 So your article made me think about ways to entice ourselves to spend more time on our twin couches again. More cosy required, I think! It’s possible that they have different policies put in place in Australia – flame retardants may not have been an issue! You know that I love your sofas : ) And, for that matter, your open plan kitchen, dining, and living room. I would love to institute a “conversation set,” but am not sure whether we would be able to pull it off – one side of the room has a big picture window that we like to keep unobstructed, and the other has a large heating vent in the floor. There is also the question of where to put the television. The fireplace is the natural focal point of the room, but I am hesitant to block it… We may have to get your opinion when you come over! As for cozying up the couches, maybe some throw blankets? I had NO idea about the flame retardant! 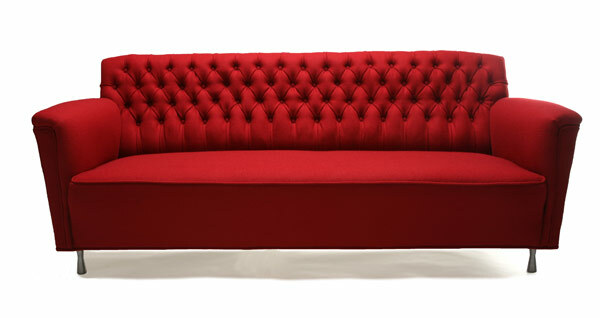 It was hard for us to choose a sofa because we had different styles – I like feminine, he likes modern. We ended up getting a modern leather couch with old fashioned buttoning and in a grey leather I chose. The couch isn’t as smushy as I’d like, but it looks great and was costly, so we’ll likely have it for a very long time! Ugh! We have that same problem too! For a while we had two dining room tables because we both found it difficult to part with our own when we merged households. Mine was oval and hardwood and his was rectangular and made of glass and metal. We are, however, finding ways for both inclinations to live in harmony! You are probably safe re: flame retardants if your couch is made of a natural material like leather. Grey sounds lovely!